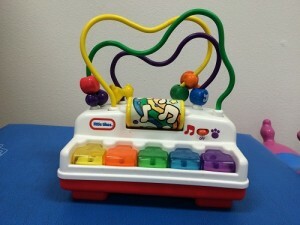 This toy ligh ts up and plays music when the keys are hit, the center roller is spun, or if one of the top wires are pulled. It plays different music for each place that the toy is activated. If you push the on button towards a paw printed side, the music will be “barked” out. TUMMY TIME: In the clinic we use this toy to motivate a child to stay on their tummy and move their head up to look at the lights and listen to the music. Eventually using the toy to have the child move their arm to activate the music. What is that working on? A FOUNDATION – The pre-skills for crawling, building the shoulder and arm strength for coloring and writing. SITTING: Having a child sit and learn that if they hit or push on the toy, it will do something that they like be it light up or play music. They have to learn to balance while sitting. They need to learn to move their arm and keep their body still so they don’t fall, but also keep their eyes on the toy.